You can now buy Kefir in Canberra - no need to make it yourself anymore - Kefir is a cultured milk drink (kind of like yoghurt, a bit like buttermilk, but arguably much better for you) which you can get all through Europe and until now I've never seen it for sale here. The Belconnen Delicatessen at Belconnen Markets have it in stock. It's produced by Blue Bay Cheese in Victoria and is simply milk, ABC probiotic cultures and kefir culture. Good and wholesome - I add a little warmed honey to my kefir and have it just like that or add it to my home-made muesli. 1 cup unsalted raw nuts (any nuts you like and any combination), break large nuts by wrapping them in a tea towel and hitting them with a rolling pin. Portion size is half a cup a day. 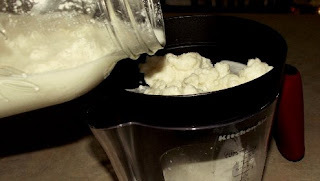 I'll have 1/4 cup with a tablespoon of kefir or plain yogurt half an hour before morning exercise then another 1/4 cup after exercise. The muesli pictured above has barley flakes as well as oats (if you're on heart medication check with your GP about eating oats), goji berries, cranberries, almonds, linseed meal, pepitas and sunflower seeds. I never make it the same twice! Canberra id the best place where people go from all over the globe just to settle. Just by using this assignmenthelp review we will come to know much about the places.